Bar and cafe in club house with changing rooms, trolley hire available. 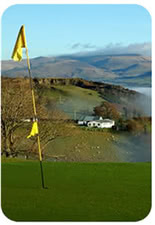 Fell course, fenced, with exceptional views of Lakeland hills and valleys and the Solway Firth. A hard climb to the 3rd and 11th holes. Testing holes: 10th and 16th.